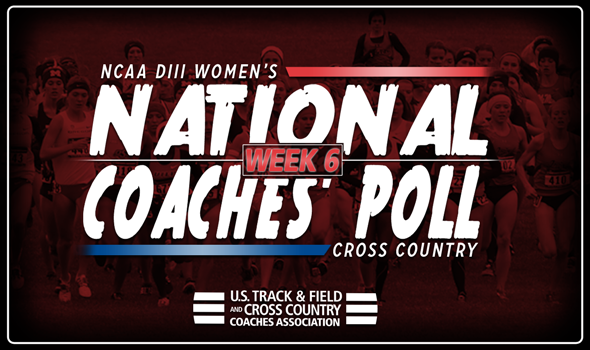 NEW ORLEANS – The biggest weekend of the regular season came and went and left a wake of change in the NCAA Division III Women’s Cross Country National Coaches’ Poll. The newest index was released Wednesday by the U.S. Track & Field and Cross Country Coaches Association (USTFCCCA) and only two teams remained in place from the previous installment. For starters, Johns Hopkins and MIT waged an epic battle over the 6K tract at the Principia Cross Country Course and that’s why they’re No. 1 and No. 2 in Week 6. The Blue Jays won the team title at the de facto Pre-National Invitational with 74 points, barely beating out the Engineers (76). Johns Hopkins proved to all of the voters why it deserved to be No. 1, while MIT showed itself to be a worthy challenger to the throne. SUNY Geneseo and Williams inched closer to the top, as they’re ranked third and fourth, respectively. The Knights took third in Elsah, Illinois, while the Ephs easily dispatched both Amherst and Wesleyan at the Little 3 Championships. Wheaton (Ill.) made one of the biggest jumps of the week as it went from No. 22 to a tie at No. 5 with Claremont-Mudd-Scripps. The Thunder finished a surprising fourth at the Pre-National Invitational and toppled a number of teams that were ranked higher than it in Week 5. Wheaton (Ill.) packed up well behind its No. 1 (Hannah Roeske, 14th) and earns its highest ranking in program history by a long shot. Notice how we said "one of the biggest jumps?” That’s because Trinity (Texas) soared 21 spots from No. 31 to No. 10. The Tigers finished sixth in the Pre-National Invitational with 188 points, just three points out of fifth (185) and seven out of fourth (178). Trinity (Texas) received strong efforts from Laura Taylor (12th) and Haley McFadden (16th). This is the first time since 2013 that the Tigers have been ranked in the top-10. Otterbein comes in at No. 11 following a win at the Inter-Regional Border Battle. The Cardinals scored 98 points (3-6-20-35-35) and beat a split squad from top-ranked Johns Hopkins and full squads from former No. 8 Dickinson and former No. 30 Haverford. This is the best ranking in program history for Otterbein. Overall there were five teams that either returned to the poll or made their first appearance: No. 25 Oberlin, No. 31 WPI, No. 33 St. Thomas (Minn.), No. 34 Case Western Reserve and No. 35 UW-River Falls. This is the first time in program history that both UW-River Falls and WPI have been ranked in the top-35. There will only be two more National Coaches’ Polls released this season: November 1 and November 14. The former will be after the conclusion of conference championships and the latter right before the 2017 NCAA Division III Cross Country Championships.